As summer draws to a close, I’d like to reflect on one of my most enlightening outdoor excursions this summer – a jog with a friend to Hunter’s Point, around a 3-mile run from my house. Although I have engaged in light jogs of around a mile in the past, a 3-mile run was definitely a stretch, but I impulsively told myself it was time to try something new. But boy was I in for a ride! One mile in and my calves were already burning, my mouth furiously gasping for breath with every step, sweat trickling down, everywhere. I felt instant regret at yesterday’s impulsive Brenna, but beared with it, telling myself “one more step” every step of the way. But when we reached the two steep hills leading up to Hunter’s Point, I gasped and acknowledged that it was impossible for my shaky legs and out of shape self to run up that hill, submitting myself to walk the hill. In fact, even hiking up that hill was difficult, and each step into the sandy ground I burned for air – and ice cream. But I told myself, “Could I really quit now?” And step after step, foot after foot, hill after hill, I climbed to the peak, the long-awaited Hunter’s Point. We arrived at sunset: a beautiful pink ombre with streaks of orange, clouds amicably drifting by with a light breeze. We gasped in awe at the view of Cupertino: cars seemed to move in slow motion, people appeared dots and buildings insignificant. And I smiled: it was a painful journey, but the sweat, dirt and grit needed to complete this run – and to hike that last hill – made the view so much more enjoyable than if we had drove up here; it was the journey that made the end result so much more meaningful. Later I learned this run was deemed “Fire Run” by some of my cross-country peers due to the fiery pain it caused in their calves, which only boosted my pride in myself for at least completing – although not running – the whole journey, and witnessing an incredible sunset I would have missed out on if I had chose my sedentary couch-potato lifestyle that day. I’m incredibly appreciate of my friend for inviting me on that run, my impulsive self for taking on that challenge and nature for allowing me to witness such a beautiful event. This entry was posted in Goal Setting, Newsletters on August 11, 2018 by Brenna Chen. A couple of weeks ago, I celebrated the end of the school year with a sweet hike in Rancho San Antonio by joining Debbie on one of her Hill Runs at Rancho San Antonio. I hadn’t gone on a hike in quite a while, and this immersion into nature was a wonderful break and transition into summer. Although I had difficulty locating the other hikers at first, we soon began to trek along the trail, surrounded by a golden expanse of plants, the blazing sun causing trickles of sweat down my neck. Admittedly, much of my focus was on the trail (attempting to avoid the dreaded dog poop! ), but I also was able to enjoy the beautiful scenery (and occasional wildlife) and novelty of being surrounded by nature rather than by books in a classroom. I loved talking to Debbie and Melissa, and their conversations about their children, interspersed with throwbacks, made me smile. I was reminded again by the great opportunities hiking provides for easy conversations and bonding. The children were also a great throwback to my own childhood and a delight. Watching them race down the hills and even sprinting with Max at the end gave me nostalgia, as I reminisced about my carefree, childish past (and even indulged in that side a little as I mingled with the children). I also loved how creative Debbie got with encouraging her daughter Holly to finish the hike, pointing at landmarks on the trail to race to until we almost reached the end, admiring and realizing the effort and creativity needed to raise children. Overall, the hike was so much fun! It was perfect timing too: a well-needed respite from school and a fitting return to summer. If you’d like to experience the trail, visit the Rancho San Antonio Trail at http://strollerhikes.com/location/rancho-san-antonio/ (but beware of parking!) I attended the Hill Runs at Rancho San Antonio, which are currently unavailable during the summer as Debbie and Melissa are both traveling, but will possibly return during the school year, so keep an eye out! This entry was posted in Newsletters on July 1, 2018 by Brenna Chen. This entry was posted in Newsletters on April 21, 2018 by Brenna Chen. Ironically, although April has arrived, bringing along the term “April Showers,” California has already displayed the weather patterns of summer with sweltering afternoons rather than rain, still gradually recovering from drought. However, one question I wondered about was what brought this term April Showers? 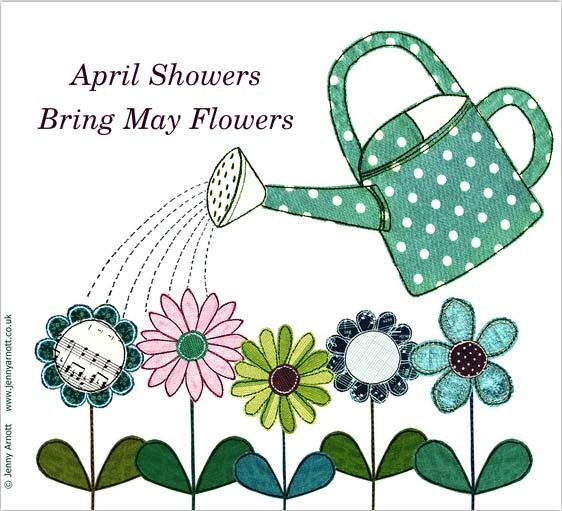 Incredibly, this phrase has been echoed throughout many centuries, even perpetuating modern society through the belief that April is the time to don rain boots, umbrellas and plant flowers to bloom in May! And another question is: is this saying true? Although not entirely relevant to California, rain does have an effect on timing and abundance of flowering, said David W. Inouye, a biology professor at the University of Maryland, College Park. Inouye, who has studied bloom times in the Rocky Mountains, noted that some plants flower at the start of a rainy season and that some species might flower a second time in late summer after another good soaking. Therefore, this phrase may hold some merit after all; however, you might have to search for a wet season and the resulting May flowers elsewhere from California! This entry was posted in Newsletters on March 31, 2018 by Brenna Chen. As spring began its gradual transition to the swelter of summer, I decided to take a hike by myself on a mildly warm afternoon last Saturday. “Maybe it’ll clear my mind,” I thought. And clear my mind it did. As I trudged on the Fremont Older trails, the sun gradually setting, the heat gradually settling, sweat gradually condensing and trickling down my face, I was shocked by the simple lack of anything typically revolving in my life. In fact, I had even sacrificed my precious phone for a more authentic experience, but I had never expected this true empty space, fortified from the bustle of outside life and faced only with the heat, the trail and my footsteps. No longer was I stressed with the thought that I had homework I had procrastinated on, tests I should study for, tasks I had forgotten. I simply allowed myself to relax, think and drift, grounded by only the steady pounding on the dusty trail. And nature was my companion, my eyes filled with the occasional intriguing tree or greenery on the side of the dusty trail, scattered with some extremely fancy houses I often stopped to admire. In fact, I easily lost track of time, only roughly estimating time by the location of the sun in the sky and my measure of exhaustion as I continued to walk on. Yet I was strangely exhilarated, liberated, at peace through my walk, simply absorbing sights, sounds, and my thoughts – or often, lack of thoughts. I realized, this is what it’s like to put down your phone, listen to your breath and your steps, and just relax – providing a brief break from reality. Although this hike was fun, I think I’ll drag my mom along next time; conversation and company would be a delightful bonus to my next adventure! To experience my hike at Fremont Older (http://strollerhikes.com/location/fremont-older/), try the 3.8 mile Seven Springs Route (http://strollerhikes.com/hike/seven-springs-loop/) or the 2.4 mile Hunter’s Point Route (http://strollerhikes.com/hike/prospect-road-to-hunters-point/). This entry was posted in Newsletters on March 30, 2018 by Brenna Chen.